If such quasi-instrumental passages suggest a composer most closely attuned to sonority, elsewhere in De profundisClemens refutes any suggestion that he might be oblivious of textual concerns. Earlier in the third section, the word ‘misericordia’ (‘mercy’) is treated homophonically and with perfect Humanist word-stress; and towards the beginning of the piece ‘Si iniquitates’ (‘If [you should observe] transgressions’) is not only sung homophonically but repeated at a higher pitch for increased emotional effect. 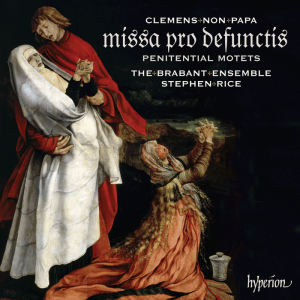 De profundis as a whole is one of Clemens’s most impressive achievements, running for nearly ten minutes as a freestanding musical structure. Peccantem me quotidie was a popular choice of text for Renaissance composers, being set by Byrd, Lassus, and Palestrina among the great names of the later sixteenth century, as well as Clemens, his contemporaries Thomas Crecquillon and Pierre de Manchicourt, and numerous more obscure figures (Manchicourt’s setting has been recorded by The Brabant Ensemble on Hyperion CDA67604). The text, a Respond from the Office for the Dead, is treated in its correct liturgical form by Clemens, though there is no evidence that it was intended as part of a liturgical cycle. Just as in Tristitia et anxietas, Clemens appears to have focused his compositional energies partly on directly text-expressive manoeuvres, and partly on musical gestures. The former is exemplified by the opening rising fourth followed by a downward tone, a frequent mournful opening as found—to name but one place—in the ‘Emperor’s song’ Mille regretzattributed to Josquin Des Prez. A second instance is the text line ‘Miserere mei, Deus’ (‘Have mercy on me, God’) which concludes both sections, where the texture is rapidly thinned down to two voices in an open fifth, emphasizing the penitential utterance with a rising and falling semitone—another device of Josquin’s, found especially in his motet on the ‘Miserere’ text. Sonorous invention is heard just before this moment in the first section, where ‘quia in inferno’ (‘for in hell’) brings a sequence descending to the depths followed by a static setting of the word ‘nulla [est redemptio]’ (‘there is no [redemption]’). In the second section, conversely, Clemens composes a rare rising sequence for ‘libera me’ (‘free me’), each repetition taking five beats and therefore breaking the regular pulse as if the vocal line is discarding its rhythmic shackles. The Offertory is both the central movement and the longest, at 4’30”. In the main it is rapid, moving in fast semibreves and homophonically. The final line of the first section, ‘quam olim Abrahae promisisti’ (‘as long ago you promised Abraham’) is more relaxed in spirit, yielding to chant (taken here by the women) and, following a further energetic verse, returning to round off the movement in a reflective vein.